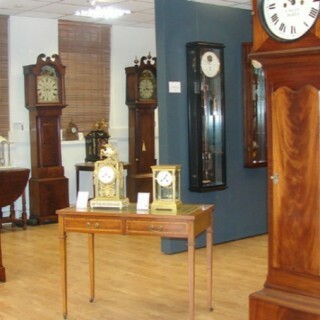 An exceptionally rare year-going four-glass clock. 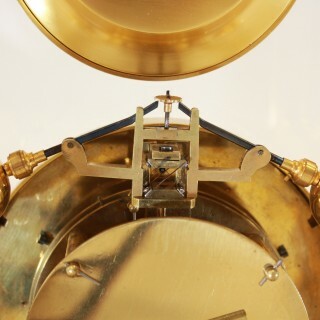 The timepiece movement has a single going barrel providing power to a Leroux-type deadbeat escapement. 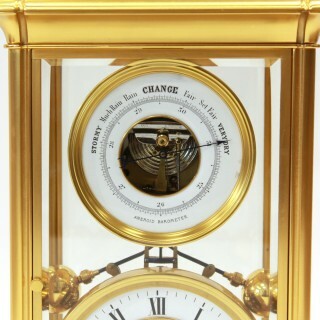 This in turn drives the equipoise compound pendulum beating seconds. The very fine pallets are fixed rigidly to the pendulum and the impulse is provided by the profile of the escape-wheel teeth. 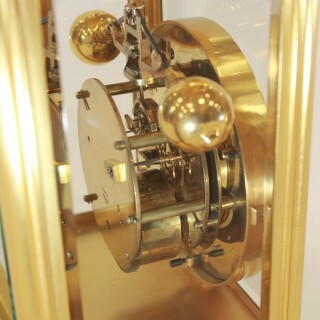 This combination of escapement and pendulum generates a very slow rocking motion of small amplitude. The movement is stamped on back plate Brevete. 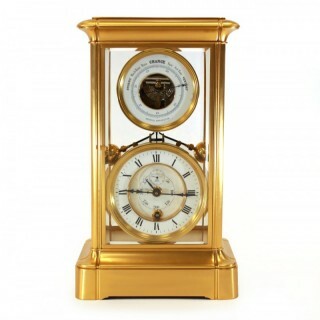 The perfect white enamel clock dial has Roman numerals, the recessed center with a “Wind-Up” indicator showing the power reserve calibrated 0-400 days with an indicator hand and a small subsidiary seconds dial. 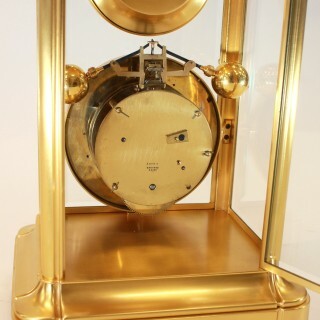 Above the clock is an aneroid barometer, with a visible mechanism through the centre of the enamelled dial. 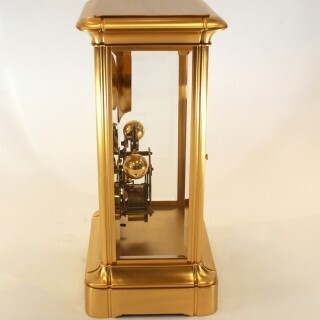 The gilded brass case is larger than the average four-glass clock , and of superior styling with rounded mouldings, giving a softer look. 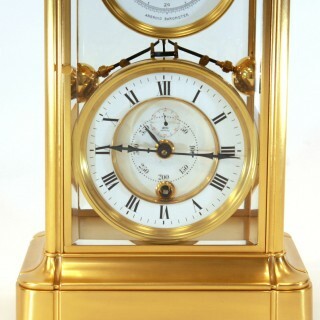 It has been regilded in 24carat satin-finish gold, and is presented in excellent condition, as new. All four sides are glazed with thick beveled mineral glasses, without blemishes or chips. The movement is to be overhauled and guaranteed for 3 years.